A UCP MLA was in Coaldale last week to discuss the upcoming electoral boundary changes to future residents of the new Taber-Warner riding. During the Coaldale Chamber of Commerce meeting on May 9, Cardston-Taber-Warner MLA Grant Hunter presented the keynote topic on the 2019 provincial election boundary changes. Last year, the Alberta Electoral Boundaries Commission redrew electoral boundaries in Alberta for the 2019 provincial election. As per the Boundaries Commission Act, electoral boundaries have to be evaluation every eight years. Hunter said that according to the majority of the commission — which is composed of two members nominated by the official opposition, the UCP, two members nominated by the governing NDP and a chair appointed by the government — there were too many ridings in rural Alberta, and more were needed in urban Alberta, where there was a higher percentage of the population. The commission had two choices; add more ridings or redraw the riding boundaries. Hunter said that the commission made the “right decision”, although he is concerned about some of the changes they had made. In total, three ridings from rural Alberta were redistributed to Calgary, Airdrie and Edmonton. In southern Alberta, that meant that seven districts — the seven ridings are Battle River-Wainwright, Drumheller-Stettler, Strathmore-Brooks, Little Bow, Cardston-Taber-Warner, Cypress-Medicine Hat and Vermilion-Lloydminster — would be collapsed into six new districts come 2019. Riding sizes are determined by a population mean of the entire province, and are allowed to deviate from that mean by up to 15 per cent. While Calgary ridings were topping out that mean, in Edmonton, Hunter said there was only a one per cent deviation from that mean. However, if Calgary got a new riding, then Edmonton had to get one. “I think there was a little more of a bias towards Edmonton, if you take a look at the numbers, in order from then to get a extra seat,” said Hunter. The new ridings are vastly different from what was originally proposed. When the commission first presented the proposed boundaries, Coaldale fell within the proposed Cardston-Kanai district, which stretched from the U.S border to north of Picture Butte, and included the Kanai Reserve. The rest of the current Little Bow District was swallowed up by a huge Taber-Vulcan district, which stretch from the Saskatchewan-U.S. border northwest to just south of the Siksika Nation. “That’s one of the reasons I was a little perplexed. The first draft that came out was completely different to the draft that we have today,” said Hunter. Although the Town of Coaldale currently lies within the Little Bow district, after the 2019 provincial election, Coaldale will find a new home in the new Taber-Warner riding, which Hunter plans on running in as the UCP candidate. Until then, the town remains within the Little Bow riding with MLA Dave Schneider. Hunter said that he checked with Schneider, and he was “fine” with him talking to the chamber that day. 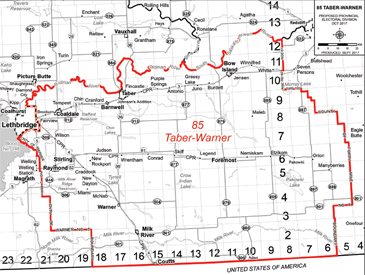 The Taber-Warner Riding goes west to the city of Lethbridge, south to the U.S. border, the eastern boundary of the county of Forty Mile and follows the Oldman River to the north. The communities of Coalhurst, Barons, Nobleford and Picture Butte will be included in the Cardston-Siksika riding, which stretches out in an hourglass shape from the U.S. Border to the Siksika Nation. Hunter says that the boundaries for Taber-Warner “go back to where it used to be”. As both Hunter and Schneider reside in what will be the Cardston-Siksika riding, they sat down with Jason Kenney and had a “gentlemen’s agreement” to work out who would run where. He said that it “made sense” to have both Coaldale and Taber within the same riding, due to their proximity in there, along with a portion of Lethbridge County, although he noted that while it is “great” to not break up counties, it is unavoidable in some instances. Coaldale Coun. Bill Chapman noted that while Cardston-Siksika was massive, and depending on where you live, it’s a “long ride if you’re going to meet with constituents”, Taber-Warner was a much more manageable riding. Hunter agreed that it was a “fairly decent riding”. By contrast, In the Taber-Warner riding, Hunter said he would be interacting with roughly the same number of communities and councils that he does now. When asked about where he planned on opening an constituency office in town, Hunter said he currently had one and Taber and one in Cardston. Noting that Schneider had an office in Coaldale, he floated the idea of either setting a second office up in Bow Island and/or Coaldale, adding he had “budgetary constraints” to consider, while keeping the one he currently had in Taber. Hunter currently resides outside of the upcoming Taber-Warner riding. When asked if he had to reside in the riding he was running in, Hunter said no. Referring back when Schneider, Kenney and himself were discussing who would run where, he said one of his concerns was moving his kids to a new school. Hunter is planning to move the Taber after his children finish high school. When asked why move to Taber, and not Coaldale, Hunter replied that the “argument I made with my wife” was that his main office is in Taber already. The constituency assistant there has 20 years of experience and is “phenomenal” at her job, and he didn’t want to lose that resource by going elsewhere. By moving to Taber, he would also be close to his main office. The UCP annual general meeting went earlier this month. They are currently in the process of setting up nominations and riding association for the 87 electoral districts. An AGM for the Taber-Warner Constituency Association goes in Taber on May 16.